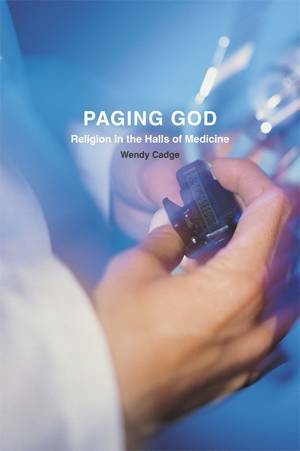 To understand the role that religion plays in American healthcare beyond the usual debates about the relation of faith and spirituality and health, Religioscope recently interviewed Wendy Cadge, author of the new book ‘Paging God’ (University of Chicago Press). Cadge is Associate Professor of Sociology at Brandeis University near Boston. Religioscope – There has been a lot written and researched about the role of spirituality and religion in health but your book Paging God is unique in taking readers inside American hospitals to study the work of chaplains and how religion is expressed in the actual world of doctors and nurses. How does your approach tell the reader something different than these studies about the relation between religion and spirituality and medicine? Cadge – Those studies are important but it’s not clear what their policy applications are. Studies that find a positive relationship between religion and health are not likely to lead physicians to prescribe prayer just as those that find no relationship are not likely to lead people of faith to become less religious or spiritual. My approach is to show how prayer and religion play a role in the daily lives of people who work in healthcare. Much less is known about what is going on inside healthcare organizations and to understand religion’s role on the ground there. Religioscope – So you studied 17 hospitals in your study. Would you say they are representative of American hospitals in general? Cadge – My study was of academic hospitals, not community or religious hospitals. But they were selected as among the most highly ranked hospitals in the country by U.S. News & World Report in the 2000s. These academic hospitals treat some of the sickest people and that they deal with most of the ethical issues in medicine today. Religioscope – In your book you go into intensive care units and emergency rooms to look at how chaplains deal with religious and spiritual concerns as well as how they interact with doctors, nurses and other staff. Was it difficult getting access to these places? Cadge – Very difficult. My original idea was to study one hospital and be able to move within all its different parts. But I could not find such a hospital [that would allow that] and decided to focus on a group of hospitals. So I became part of a chaplaincy team at one hospital and volunteered in the intensive care unit at another. I couldn’t get permission [from the doctors and hospital authorities] to interview patients so I focus on the interaction of chaplains with hospital staff and vice versa. Religioscope – One of the ironies running through your book is that the more institutional and particular religious concerns and practices are accommodated more by nurses and other hospital staff while the chaplains pay more attention to a generic spirituality. Can you explain why this is the case? Cadge – These different groups accommodate religious diversity very differently. Chaplains try to include everyone in their ministry and be as broad as possible to connect with everyone’s religious and spiritual views. It’s a general or what is called a “meaning-making spirituality.” This can also be explained by how the professional evolution of the hospital chaplaincy is different than, for example, the military chaplaincy. There was a strong mainline Protestant history in the hospital chaplaincy, and today you still find a lot of mainline Protestants and those on the liberal end of the doctrinal spectrum. Religioscope – Because of these differences, you find that there are some communication problems between chaplains and hospital staff when it comes to religion and spirituality. Cadge – Yes, though there is a big effort to train doctors and nurses to accept religion and spirituality more. Some chaplains have become part of a healthcare team and get to know [hospital staff] more. There are programs where nurses and doctors try to familiarize themselves with chaplains. This is especially the case with nurses, who have always worked more with chaplains and are more open to spiritual and personal concerns [than doctors]. But many [staff] do think of religion mainly [in terms of] the kind of religions that they practice. That’s ok until a conflict arises or they are working with a patient who is religiously or spiritually different from them, which often happens. Religioscope – You write that it is especially in cases where patients’ or their families’ beliefs or practices interfere with treatment where these conflicts emerge. Can you provide an example of this? Cadge – It can be when patients or their families are waiting for a miracle and want to keep a treatment up when doctors want to end the treatment. In many cases, doctors don’t have the resources to deal with these conflicts. Religioscope – Do particular religious groups tend to be involved in these conflicts, such as Pentecostals or charismatics who believe in miraculous healings? Cadge – No, it’s across the board. The news may focus on particular groups but it’s a whole range of individuals. Religioscope – Although you didn’t interview patients, how do you think they respond to the generic approach of chaplains? Cadge – It’s hard to tell, but I have shadowed chaplains and have observed what they’re doing and they do seem able to connect with patients. You have to remember that chaplains are the only healthcare professionals that a patient can throw of their room [unlike] a nurse or doctor that is treating them. They may not understand that chaplains don’t proselytize, and they don’t understand the things chaplains do. Religioscope – How do you view the present and future of the hospital chaplaincy? Will the broad, generic approach chaplains take remove the profession so far from religious traditions and institutions that hospitals will take a more secular approach, asking what difference is there between having them or not? Cadge – My sense is that it’s not the broadness of the chaplaincy that is the challenge but rather the ways in which they are supported financially. Chaplains are finding new roles that are needed within hospitals. For instance, they are acting as liaisons between the hospitals and the funeral home when a patient dies in some hospitals. Two-thirds of hospitals have chaplains, though we don’t know how many are volunteers. Some chaplains are paid by hospitals. Fewer are supported by their local religious organizations. Hospital chaplains have often been in a precarious financial situation throughout the development of the profession. Religioscope – Yet it seems that it’s especially in matters dealing with death where chaplains will be needed. Cadge – Chaplains have special skills in dealing with end-of-life matters, notifying next of kin, helping patients make end-of -life decisions. There are doctors getting more training in palliative care, but hospitals generally don’t want to focus on death; they are about getting patients well. Religioscope – You see hospitals as being similar to other institutions in witnessing the rise of a secular spirituality that is separated from religious traditions, and symbols. Where else is this happening? Cadge – I have been developing a new research project on how secular institutions accommodate religion, It’s an issue in universities since we see a growing number of young unaffiliated Americans as well as in ports, fire departments, police departments, prisons and a range of other institutions. It’s an empirical question.